Freestanding bathtubs are becoming more and more popular today due to their spa-like feel. Long gone are the days of noisy bubbling jets and in with the quiet and serene soaks. Freestanding tubs can update any bathroom and provide an element of tranquility. While the classic shower/bathtub combination may be efficient, it is not as efficient for relaxation. Freestanding tubs look updated and fresh. They are one of the most popular options on the market today and can help to create an updated look to any bathroom. They are available in almost any style. Freestanding tubs come in a variety of styles, from modern and sleek, to classic and ornate, and everything in between. Freestanding tubs come in a variety of materials. Popular materials for freestanding tubs include stone, acrylic, copper, wood, cast iron, and fiberglass. The price of a freestanding tub will vary greatly, depending on which material you choose. They are visually lighter than built-in or drop-in tubs due to the open area surrounding the tub, and even underneath of the tub depending on which style you choose. 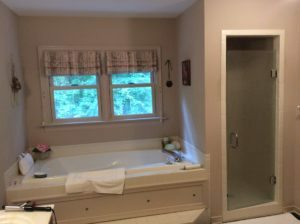 Traditional drop-in and built-in tubs are very bottom heavy and bulky since they are “built-in” against the wall and take up entire sections, or corners, of the bathroom. Freestanding tubs can be placed almost anywhere since they don’t require wall space to be installed. Thus, freestanding tubs serve more as furniture and a structural element to any bathroom, as opposed to a bulky tub in the corner. For example, we recently completed a bathroom remodel in which we replaced a once bulky jetted tub to an elegant clawfoot slipper tub. The transformation of the space when the new bathtub was installed was remarkable. The tub that these clients chose blends the vintage characteristics of traditional clawfoot tubs, while keeping a simple silhouette and feet. Before you decide on a freestanding tub for your bathroom, it is important to consider your space, budget, and needs. 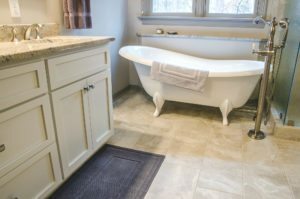 These types of tubs may not be a good choice for small bathroom remodels since they come away from the wall so they typically require more room than a traditional built-in or drop-in tub. Pro tip: when choosing the size for a freestanding tub, make sure that it comfortably fits the largest person who will be using it. Additionally, some standalone tubs can get rather costly, depending on the material you choose. Also, it may be worth considering how frequently you plan on indulging in a bath? Once a week? Once a month? This can help you determine whether installing a standalone tub will be worth your investment. If you have any questions, feel free to contact Balducci Remodeling at balducciremodeling.com and set up an appointment for a free estimate. No obligations.